Prepare for a sensory overload as our partner-led (Dive Otago) Dive Galapagos Group Tour takes you on a one-of-a-kind liveaboard adventure to Dive the Galapagos Islands in Ecuador. Explore one of the world’s most renowned dive locations that flourishes with prolific numbers of wildlife in and out of the water. This beyond ordinary experience combines thrilling diving experiences only accessible via liveaboards with epic land excursions. Discover amazing Dive sites including: Darwin’s Arch, Wolf Island, Cousin Rocks, and Punta Carrion to name a few, each with their own diverse and unique marine environments and wildlife encounters from schooling Hammerhead sharks, sea turtles and famous iconic giant tortoises and more. Return airfares and taxes from Dunedin via Auckland to Galapagos Island via Santiago/Guayaquil. 2 night pre twin & post twin/double share accommodation at Holiday Inn Guayaquil Airport (stopover either side of Liveaboard). 7 x nights twin share : Dive Liveaboard on Aggressor III. Diving: Approx 11 morning dives, 8 afternoon dives, 1 night dive | includes tanks, weights & belts, all meals & snacks (except 1 x dinner), non-alcoholic beverages, local beer & wine. 1 x afternoon tour of Santa Cruz Island. Add on options: Dive package upgrade. Start you liveaboard experience with a dive amongst White Tipped Sharks, Stingrays, Eagle Rays and Marbled Rays, Scorpion Fish, Sea Turtles and Sea Lions. World famous sites provides thrilling diving with Schooling Scalloped Hammerhead Sharks, clouds of Tuna, Galapagos Reef Coral and occasionally Whale Sharks and Orcas. Dive down 20-90ft dive site for spectacular marine adventures starring Groupers, Creole Fish, White Tipped Sharks, Barracudas, Scorpion Fish, Sea Turtles, Guinea Puffer Fish, Red Lipped Batfish, Reef Corals and occasionally Hammer­heads and Bottlenose Dolphins. Spectacular views of Pinnacle Rock, the immense black lava flows at Sullivan Bay and the rest of Santiago Island, and Daphne Major and Minor. On land walk amongst the iconic giant tortoises in the Galapagos Tortoise Reserve, get up and close with Land Iguanas, take photos of Blue Footed Boobies, and experience stunning land­scapes including the Los Gemelos (The Twins, two enormous sinkholes). A combination of dive knowledge and experience, close to 1000 dives logged and over 1000 divers certified, Tracey is an ideal Group Tour Leader for this Galapagos experience. 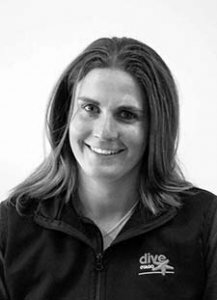 Since completing her Masters in Marine Science at Otago University, Tracey became a dive instructor and holds a Course Direction qualification through PADI in Malaysia. Dive experiences have taken Tracey to some of best dive sites in NZ and around the world. Ask her about the favourites and there’s definitely more than a few on her list including Sipadan and Mabul in Borneo, the Yongala wreck out of Townsville, Australia and the Poor Knights and White Island, New Zealand. A deposit of NZD $1,000 (pp) is required at the time of booking with second payment due 3rd August 2018, third payment due 4th January 2019 and final payment due 4th April 2019, prior to departure. Group size is based on 16 travellers. Unless specified prices exclude meals (unless specified), insurance, equipment rental, nitrox refills, dinner on final evening, crew gratuity, USD $100 Park fee, $20 Galapagos Visitor’s Visa card, certification or specialty courses, other activities and all items of a personal nature. AIRFARES: Based on return adult economy airfares from Dunedin/Auckland to applicable point of destination, inclusive of taxes and selected travel dates apply. Subject to availability until time of ticketing and pricing is subject to change without notice. Additional levies, government charges, and fees may apply that are beyond our control. ACCOMMODATION Subject to availability. Specific room types, bedding configuration, features and amenities may apply. Special requests should be advised at time of booking and are not guaranteed.